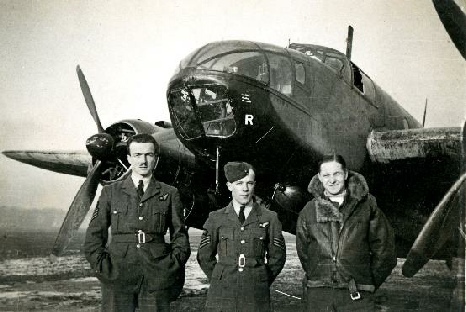 Bill volunteered for the RAF in July 1940 and, after an initial period in the Reserves, he was enlisted on 1st October. Initially, there was intensive training as a Wireless Operator followed by training as an Air Gunner after which he was drafted to 42 Squadron in Coastal Command, flying in Bristol Beauforts. The Beaufort was a twin engined torpedo bomber with a machine gun turret in the middle facing back and with an observation and bomb aiming area in the nose which housed a second, smaller gun position, allowing automatic backwards firing in addition to manual side guns. 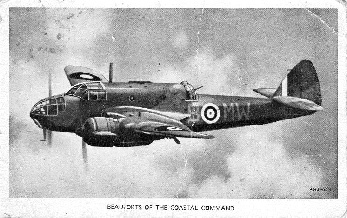 Each Beaufort had a crew of a pilot, a Navigator and 2 Wireless Operator/Air Gunners with the aim of patrolling the Norwegian coast and observing or attacking German shipping as required. that he met and flew with Sydney “Sid” Addison, a fellow WOP/AG and the two became best pals for life. Flo and Chris, then aged 3, occasionally visited him when he had short leave and on one trip to the Shetlands Chris began a rather unusual life-time love of the smell of cordite. Of course, after a mission the smell of cordite on Bill’s uniform from the machine guns was overpowering so when he picked her up for a hug her love for the Daddy she rarely saw made the smell unforgettable. Some of the planes had icons painted on the fuselage. Utilising his considerable painting skills, Bill designed the “Nark” and painted a 6ft version on their plane. being an Ozzy, came up with the name. 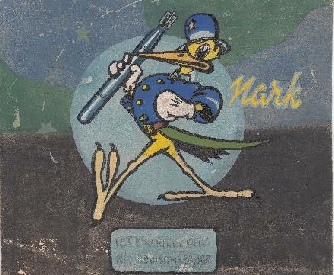 The picture of the “Nark” ( Right ) is the design from Bill’s Wartime Log. had been successfully torpedoed by this plane. Ernest “Birch” Birchley and Kiwi P/O Alan Wells. and refused to use any green pen.